1) As mentioned earlier, I like to alternate between fighter props and fighter jets (F-15C, P-38L, A-10C, P-51D, F-4E, etc. ), so the next build needs to be a prop. 2) My last 3 builds were not very good kits, with the Trumpeter 10C and Trumpeter P-38L the very worst. That's why you don't see Warthogs and Lightnings very often. The kits require a ton of work to make them look average, so I need a break from crappy kits that don't fit together. 3) The Tamiya Spitfire, like the Corsair and Mustang, is as good as a plastic model kit gets. It will be fun to put plastic pieces together and they actually fit. 4) My last 3 builds have been huge, with two of them about 2 feet wide or long. This makes them unwieldy on my work table and even harder to photograph in my small photo booth, so it will be nice to deal with a model that I can hold in one hand. 5) My last 3 builds were either super clean or only slightly weathered. Up until the Warthog, my modeling focus was on heavily weathered aircraft like the Mustang and the Phantom. It's time to get dirty again! 6) The MAIN REASON: In order to spend countless hours on a build that, for me, takes 18 months or more, I need to be emotionally invested in the aircraft. I have to either love it or have another emotional reason to build it. I think that's why many modelers have unfinished models on â€œthe shelf of doomâ€. They maybe liked the model OK at first, but after time and a few struggles, it was easy to abandon the project. This has never happened to me yet, because I truly loved each aircraft I have built. I love the Spitfire as much as I do the Mustang and Lightning, but I have another reason. My father and 4 or his brothers, all served for the RCAF in WWII, with one brother a Pilot on Liberators, one a â€œBomb Aimerâ€ on Lancasters and my father an â€œAirframe Mechanicâ€ on Spitfires, with two brothers remaining home in Canada in aircraft training roles. Thankfully everyone survived the war, including the pilot and bomb aimer, which is quite a feat after many â€œOpsâ€ or Operation Sorties. As you probably already know, Bomber Command crews suffered an extremely high casualty rate: 55,573 killed out of a total of 125,000 aircrew (a 44.4 percent death rate), a further 8,403 were wounded in action and 9,838 became prisoners of war. When I was a kid, my father told me about many memories he had of the war, the most notable being that when the Spitfires would return home to their base in France, they would fly over the runway first as a group, before landing. Many times, fewer Spits landed than had taken off earlier, having crashed or were shot down. My father's main task was to repair damage to the fuselage so that the aircraft could fly again. Sometimes it was a miracle that the Spitfire had returned safely at all, with all the damage acquired during the last sortie. He also told me of ME 262's attacking the air base and by the time the Spits were airborne, the jet was long gone. My father proudly told me that he was the first into the foxhole and the last to come out when the air base was attacked. I have no idea how much of this was true, but I suspect that most of it was. One thing for sure, was that he lied about his age when he enlisted to join his older brothers, because he was only 17 at the time. This I have found out since, was a very common phenomenon during that time when the war effort required as many recruits as possible. I never did make that Spitfire for my father, but I did complete a few other models and I was working on a 1/32 Academy CF-18B about 7 years ago when it struck me: Why not build a Lancaster for my Uncle Will, the bomb aimer? He was 89 yrs old at the time and sharp as a tack- and a very, very nice and gentle man. I loved the guy. 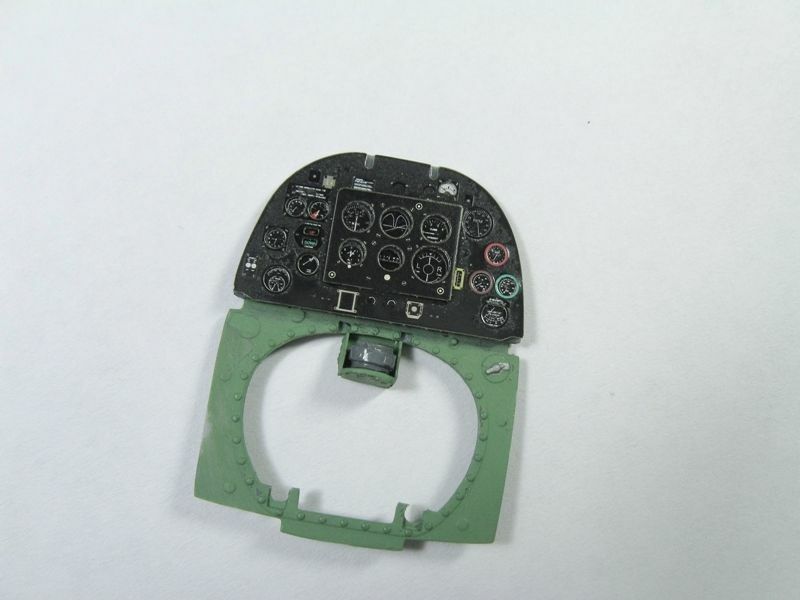 My plan was to build a â€œquick and dirtyâ€ 1/48 Tamiya Lancaster for my uncle, then get back to the Hornet build. Well, a trip to a local air museum at Nanton with my uncle to do some research on the â€œLancâ€ housed there changed all that. 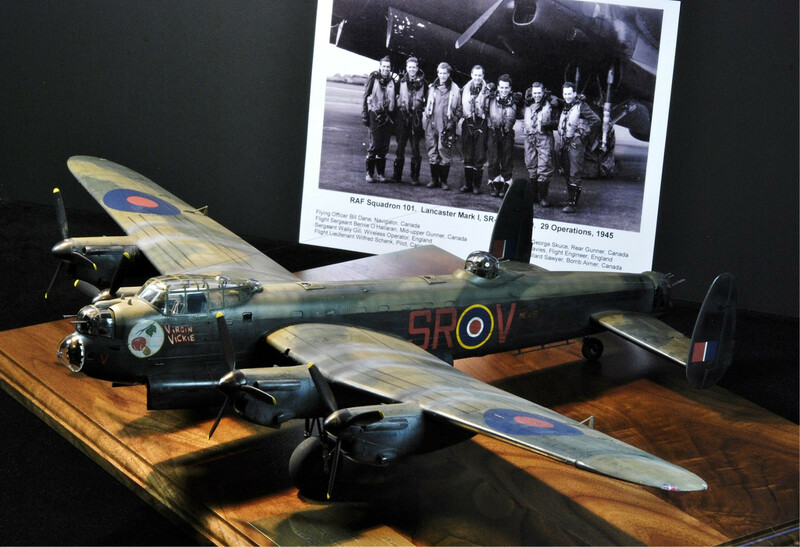 The more I researched the Lanc, the more I fell in love with the aircraft. Here's a pic of my uncle in March of 2010 at the rear of that Lanc. 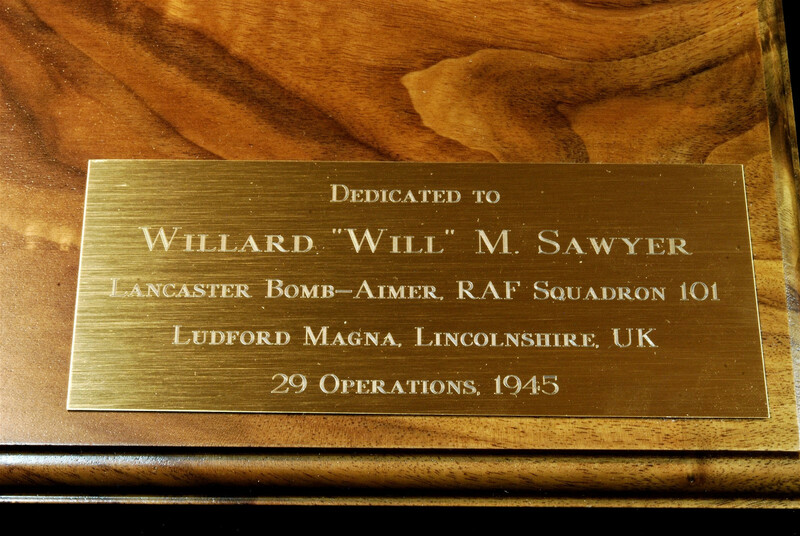 Soooo, 15 months later, after researching his bomb aimer diary and doing a lot of research on the web, I completed my uncle's Lanc in May, 2011, including the 101 Squadron code, serial number and even the nose art he always had a picture of in his wallet. He was thrilled and he kept this model on the mantle over his fireplace for all to see. That's a picture of him on the right with his aircrew behind the model. The last 2-3 of the 29 â€œOpsâ€ were dropping food in Holland immediately after the war, since the Dutch were starving. My uncle told me that the Dutch laid out â€œThank youâ€ signs made of flowers on the ground as they flew over. Now a little bragging. 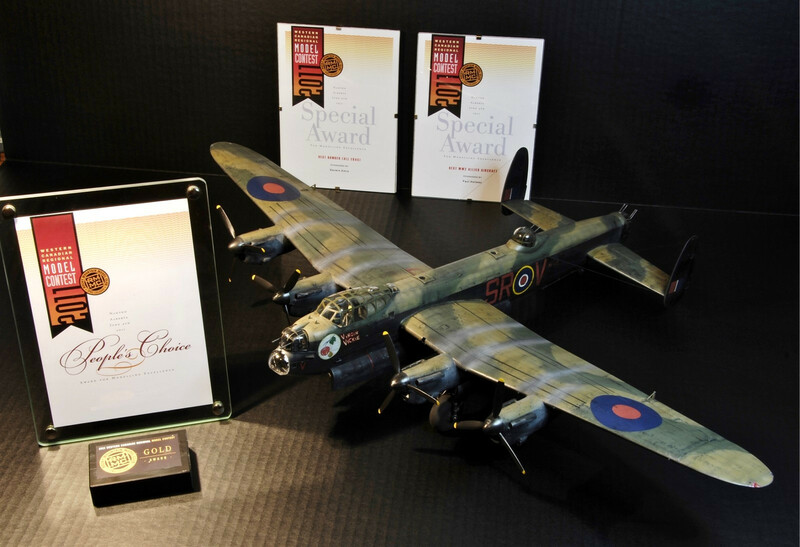 My uncle and I entered that model in the local Western Canadian Regional Model Contest in June, 2011, my first model contest ever, and it cleaned up: Best Bomber, Best Allied Aircraft, Gold in its category and the â€œPeople's Choice Awardâ€, voted as the best model in all model categories, by those who viewed the model contest. Somehow the emotional dedication I had invested in this build for my uncle showed through and was rewarded. Pretty cool. 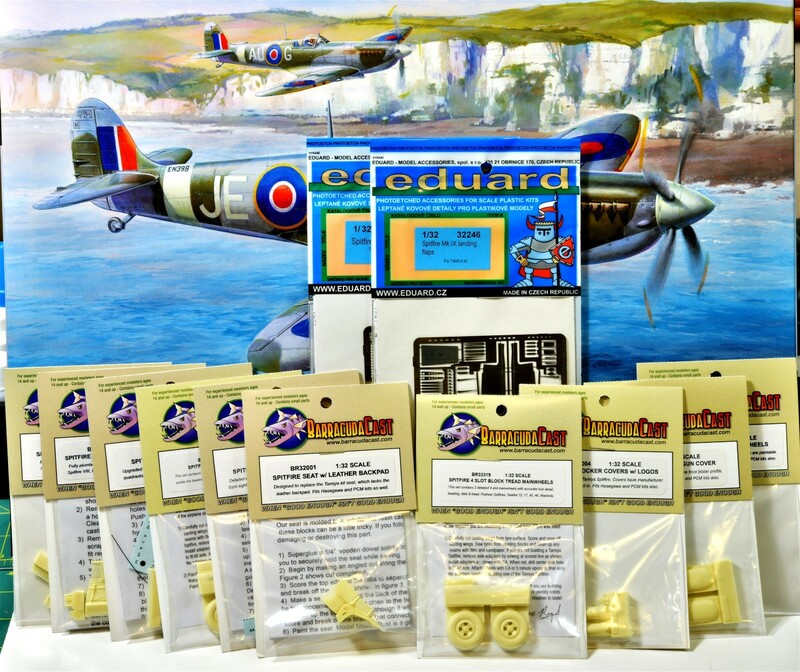 My uncle died at the age of 90 a few months after that contest, but I know our collaboration on the build and his joy of owning the model was priceless, which brings me back to the Spitfire. I need to build this Spit for my father, even though he died years ago, so let's get on with it! It's going to be modified like crazy and I hope it will turn out as something very special, which is very hard to do with this kit, since there are so many fantastic builds out there already (think Wolf Buddee!) This should be fun, so here's where I am so far. - About 6 books, including â€œSpitfire II, The Canadiansâ€ (with a 401 Spit on the front cover), Haynes Rolls Royce Merlin Workshop Manual (1933-1950), Brett Green's â€œTamiya Spitfire How Toâ€ book, Monforton's Spitfire Mk IX and XVI engineering manual and a few other references. Give me a week or two and I should have some real progress to show. In the meantime, I'm all ears for tips! Great project, Chuck. I'm not sure why you didn't pick a Trumpeter Corsair, though. Wow, this is going to be good. One kit that i MUST have in my stash. Wow, thats an amazing spread of goodies right there. will be watching this one. i enjoyed every bit of this kit. hope you decide not to use any of Tamiya's decals and give HGW's wet transfer stencils a go at it. YES!!! Chucks got a new project! Bullet 6 -- I totally agree with you, Chuck! My first attempt on this kit ended in "failure", so I bought a replacement and the other 2 versions as well (along with Revell's latest offerings)! I love this aircraft and if ever start these kits, I'm pretty sure I will finish them unlike all the other kits making up my ever growing stash! May I recommend a last addition to your AM list ? The Yahu instrument panel is actually the most gorgeous piece of AM I have seen. Brilliant anecdote, looking forward to following along. This is going to be an exciting build to follow, good luck Chuck, and I can't wait to see what you'll teach us during the build. A rewarding introduction. Thank you. Where's the plastic? I was having serious withdrawal symptoms after your last build log finished. I very much look forward to following along with you on this journey.